Today, allowing your child to participate in youth sports is becoming more and more frightening for parents. They have many concerns about the safety of their children in the event of an accident or medical emergency. It’s important that facilities offering youth sporting activities alleviate some of these concerns by setting up successful systems addressing emergency health situations. Facilities that request their youth participants’ parents complete an emergency contact form project a willingness to assume an informed responsibility for the children. It should be a well prepared, thorough form that’s professionally prepared. 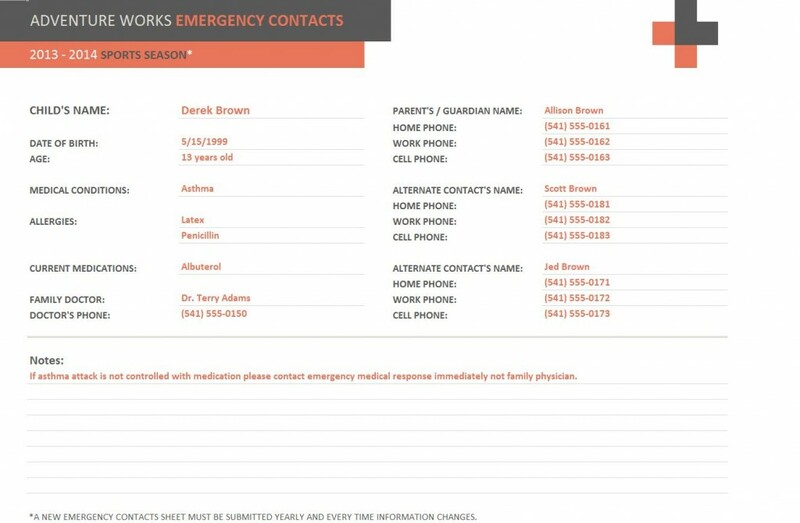 To project that professional image, download an easy-to-use “Emergency Contact Form Template” right here. The template is available for free on this page and its customizable to meet the needs of your organization. Parents would naturally be somewhat more relaxed about leaving their child in the care of a facility that maintained such important information about their child or children. This is especially reassuring if it is updated periodically by the facility. They are even more impressed when contact information is added to that list. When all these details are included in an emergency contact form, parents or guardians generally feel a sense of relief that the facility their entrusting their children to is capable of provided or obtaining emergency care and making emergency contacts when it’s needed. Using the right emergency contact form template will insure that all the necessary details will appear on your facility’s emergency contact form. Give the parent’s of the children you’re in charge of the peace of mind they desire by showing your concern for what they treasure most by implementing the use of a complete and professional emergency contact form.